With rounded, almost bell-shaped handles and elegant details, the Brecklyn centerset bathroom faucet exudes a traditional, tailored style. The faucet is available in Moen's exclusive Spot Resist Brushed Nickel finish, which resists fingerprints and water spots to maintain the fixture's brilliance. Brecklyn also comes equipped with an easy-to-install, push-down drain simply press to seal and release. Brecklyn Two-Handle High Arc Bathroom Faucet In Spot Resist Brushed Nickel With rounded, almost bell-shaped handles and elegant details, the Brecklyn centerset bathroom faucet exudes a traditional, tailored style. The faucet is available in Moen's exclusive Spot Resist Brushed Nickel finish, which resists fingerprints and water spots to maintain the fixture's brilliance. Brecklyn also comes equipped with an easy-to-install, push-down drain simply press to seal and release. 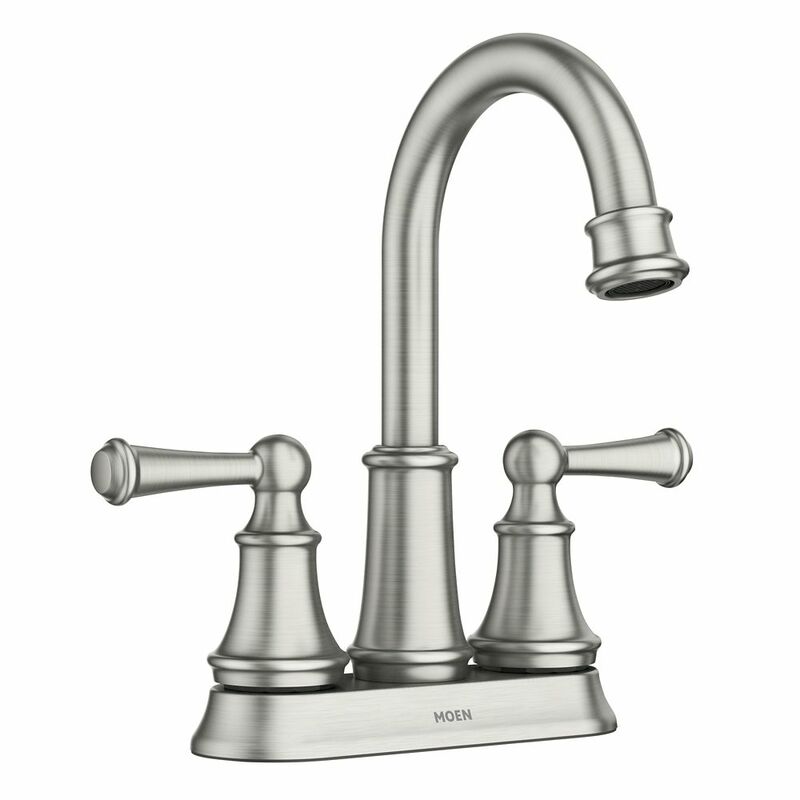 Brecklyn Two-Handle High Arc Bathroom Faucet In Spot Resist Brushed Nickel is rated 4.9 out of 5 by 23. Rated 5 out of 5 by osu123 from Nice faucet High arc faucet which gives you plenty of room to wash your hands. Highly recommend. Rated 5 out of 5 by Golffitz from Project still in process but the faucet looks great!... Project still in process but the faucet looks great! Rated 5 out of 5 by CM from The faucet works nice and was easy to install. The faucet works nice and was easy to install. Rated 4 out of 5 by Marilyn from Plumber recommended.... Plumber recommended.